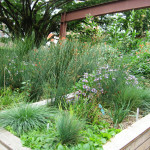 There are plenty of ways besides building rain gardens to manage stormwater runoff! 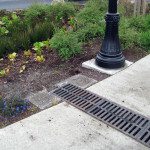 Check out the photos below of several other methods of stormwater management. 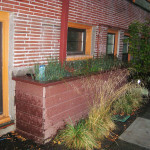 Stormwater planters function something like rain gardens – but built up rather than dug into the ground, and with an overflow outlet instead of draining into the soil. 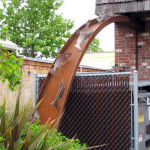 This creatively built art piece directs stormwater over a dumpster and into a planted area, while distracting from the dumpster as well! 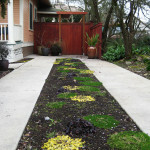 A split driveway, also called a Hollywood driveway, allows stormwater to soak into the middle strip, while supporting vehicle weight on the left and right. Pervious paving supports the weight of vehicles, while allowing stormwater to soak easily through to the ground. 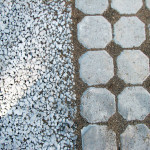 On the left is pervious paving, on the right, pervious pavers. 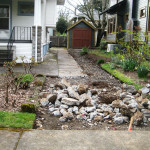 You can decrease the runoff from around your home by breaking up unused paved areas (called “depaving”) and planting there instead! This “ecoroof” (actually at ground level!) is a demonstration of an “intense ecoroof.” Intense ecoroofs have much deeper planters than regular ones, and require more structural support. 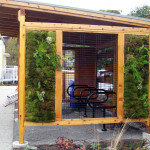 This is one of our living walls at EMSWCD, with a planted mesh built into the side of our outdoor bike shed. 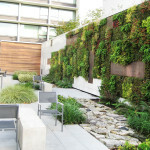 A standing living wall will absorb some stormwater while making a nice landscape feature. 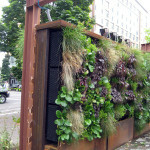 Another living wall at a hotel in downtown Portland – living walls both absorb stormwater and can help improve air quality. Trench drains capture stormwater on sidewalks or paths, and let the runoff flow into a rain garden, swale or other landscaping feature. In this parking lot, small speed bumps also help manage stormwater runoff! The speed bumps direct the runoff into the adjacent lawn, rather than letting it run into the street. 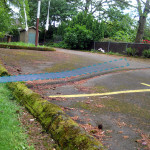 Here is the same photo with an arrow to show the direction of stormwater running off into the grass.